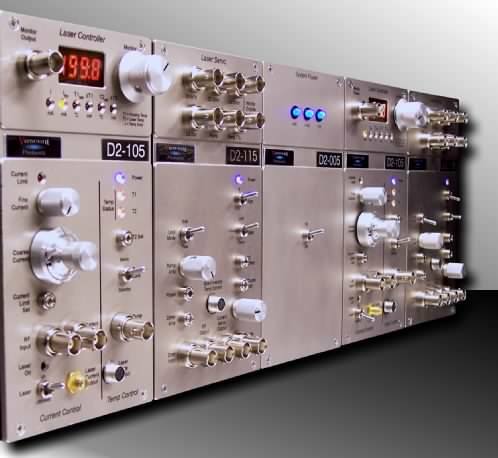 Low noise, high-bandwidth analog electronics is our specialty. From design and component selection to enclosure design, we pride ourselves on pushing performance and usability. All of our enclosures form tight Faraday boxes with careful construction to ensure electrical contacts between panels and careful grounding. In order to get the lowest noise, there are no switchers or micro-processors that radiate noise. Our low noise, linear power supply is external, which keeps 60 Hz off sensitive signals. All signals are available via front panel connections or buffered monitors. Our analog electronics modules are designed to be either stand-alone modules or they may be placed next to each other in a “rackless rack” configuration. Power is transferred from one module to the next via back panel power bridges. Input and output signals may be sent between modules via short front-panel BNC cables for easy access. The most important attributes of our analog electronics products are performance and useability. 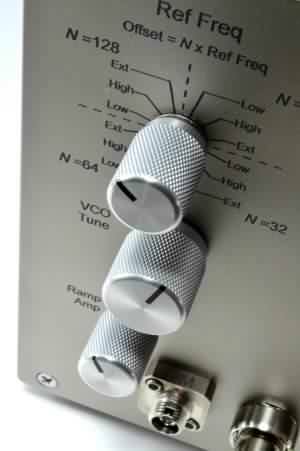 For performance, this means the analog electronics specifications, primarily noise and bandwidth. For useability, this means both functionality and user access. As researchers in labs, we have all had stories of frustration where in order to gain access to useful electronic signals, we had to drill holes in boxes or snake wires through lids. For our products, we decided to provide the user with all of the monitors and control points they might need. Our front and back panels may be crowded, but they provide you with access. For example, if the user does not want to modulate the diode directly for peak locking, then the front panel BNC connection to the diode can be used to modulate an AO or EO modulator instead. We found that the standard enclosures were lacking in our performance criteria. Plastic designs suffer from insufficient electrical shielding and conventional enclosures can not be conveniently arranged next to each other which leads to awkward “towers” of stacked electronics. Beside noise, internal power supplies lead to a rat’s nest of power cables. To meet our needs and provide a better solution to our customers we designed our own enclosures. These are of a solid metal construction, with excellent ground connections throughout the box (screw holes are masked prior to anodization to provide good contacts). The solid walls enable the units to be stacked vertically as well as side-by-side. We also keep noisy fans and power supplies away from sensitive analog signals. Finally, we apply a nickel coating to the front-panel for good measure. The result are our D2 analog electronics modules, “excellence by design”. SLICE-QT is a Four-channel benchtop Temperature Controller. The SLICE-QT offers four independent channels of PID temperature control for your lasers, photonics crystals, PICs, and non-linear devices.